On the bright side stitching down the lower edge of the facing was a joy - lovely crisp cotton which held a finger-press so well that all I had to do was clip into the inset corners and finger press around the curves and pin them into place. No running a gathering stitch around the edge, not even a press needed - just finger press and pin! The next lot of blank staring came when I had to decide on embellishment. It needed something to balance the burgundy facing, but since it's unlined I didn't want anything too fussy on the inside. I thought of a spiral of a strip of ruffle, and looked for my rolled hem foot. It is MIA, and I almost went nuts looking for it. I wonder if I gave it to a friend thinking I wouldn't use it? Can't imagine why I would, since I'd tried it and knew it worked, and I like baby hems on light fabrics. Nothing else was sparking any ideas, so eventually I gave up and hit the net to blog surf. 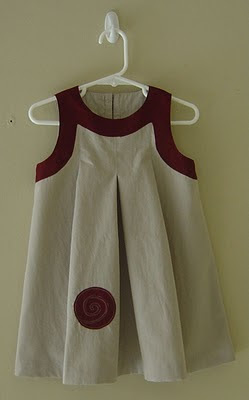 Somewhere I saw a dress decorated with dozens of appliqued spirals - perfect! The geometric shape works much better with the lines of this dress than the organic shape of a flower would have, in my opinion. So, the end result is a dress which I like very very much. It is unfussy, striking, and very much to my taste. Much easier to envision than produce! I deliberately drafted it too small for Isabella so I wouldn't be tempted to keep it. Then I drafted it in her size, because she needs one too! That is a beautiful one of a kind little dress. Nice work! This is my favorite thing so far. Absolutely. I LOVE the graphic design of this. When I first saw the image I thought it was black, not burgundy (it's really sunny in here today so my screen's a little reflective). Black would be great too, but the burgundy is lovely. Now I'm going to have to scrounge through all my patterns and see if I can find something similar because I am WAY too lazy to figure out drafting that thing myself. And I Must Have It. That really is very beautiful.. hope it finds a lovely stylish home to hang out in.